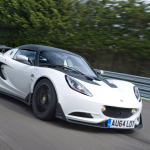 The Lotus 3-Eleven is the most powerful road car to wear a Lotus badge and Hethel’s quickest ever road car. It joins the ranks of those rare cars that can reach 60 mph in under three seconds and 100 mph in six seconds. To complement these figures, the Lotus 3-Eleven possesses a purity of the driving experience and the benchmark handling for which all Lotus cars are renowned, enabling a lap of the challenging Hethel circuit to be completed in 1 minute 19.5 seconds for the Race version. With the standard lightweight carbon composite bodywork, the Lotus 3-Eleven has a dry weight of 890 kg and maximum power of 460 hp (Race version). It has an enviable power to weight ratio of 517 hp per tonne, and is capable of sprinting from 0 to 60 mph in 2.9 seconds and boasts a maximum speed of 180 mph (290 km/h). The Road version with a dry weight of 925 kg and a maximum power of 410 hp reaches 60 mph in 3.3 seconds before reaching a top speed of 174 mph (280 km/h). 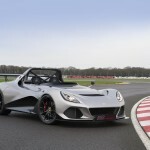 Unveiled at the Goodwood Festival of Speed in 2015, the 3-Eleven will soon be entering production with deliveries of cars to customers from March 2016 onwards. The 3-Eleven will be an exclusive car with a total production run limited to 311 vehicles. The aggressive stance and dramatically sculpted body in lightweight carbon composite, standard on both Road and Race versions, perfectly balances the competition focus of a track car with the surface refinement of a road-going supercar. In keeping with performance orientated design, an optional Carbon Tonneau Cover is available for both Road and Race versions. In either left or right hand drive configurations, removable aerodynamic cover efficiently smoothes the airflow over the cockpit and turns the car into a competition inspired single seater. As expected for such a focussed and extreme a sports car, the Lotus 3-Eleven delivers high levels of aerodynamic downforce from the sculptured bodywork, rear wing, front splitter and flat floor and rear splitter. At 150 mph (240 km/h) the Road version produces 150 kg of downforce; the Race version with its twin front canards mounted on both sides and its adjustable rear wing produces 215 kg. 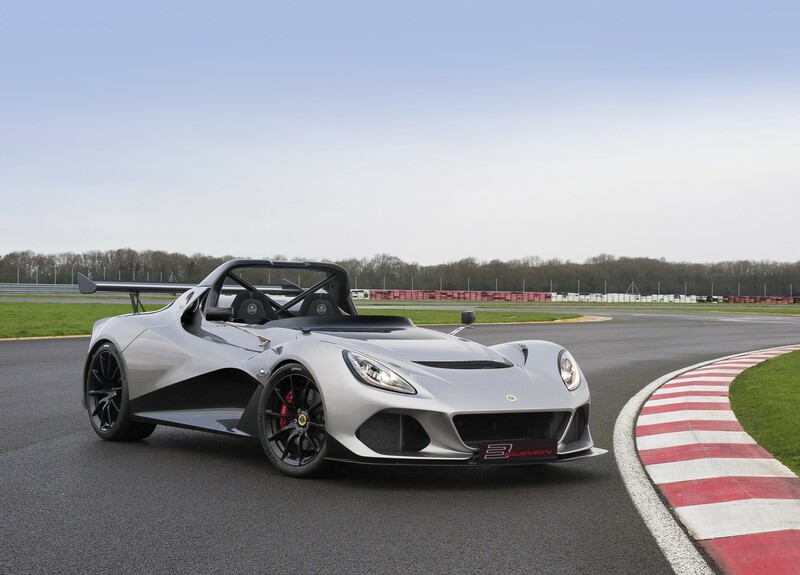 Not only does the Lotus 3-Eleven possess giant slaying straight line performance, it also generates a lateral acceleration of 1.5 g steady state whilst cornering. A lightweight Lithium-ion motorsport battery is fitted on both the Road and Race cars saving 10 kg over a typical lightweight battery. 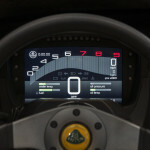 The new colour TFT instrument cluster can be switched between road and track modes, with numerous user customisable screen pages available to scroll through. An option for Road and Race versions is a Road to Track Logger and GPS Unit with a further opportunity to upgrade this logger with professional data analysis software. The Race car has a high level competition spec Xtrac 6-speed sequential transmission with a semi-dry sump, oil cooler, cassette-type plate limited slip differential and paddle shift. A close-ratio six-speed manual gearbox with a Torsen-type limited slip differential, featuring a performance clutch assembly and oil cooler, is fitted on the Road version. The manual gearshift mechanism uses light weight machined and cast aluminium components which are so technically aesthetically appealing they are exposed through an open-gate design, further reducing weight. 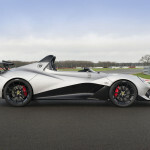 The Lotus 3-Eleven’s suspension features lightweight, double-wishbones front and rear, with an adjustable anti-roll bar as standard on the Race version and an option on the Road car. The 3-Eleven uses Öhlins dampers, with 2-way Öhlins dampers as standard on the Race car (a cost option on the Road car). The adjustable dampers and anti-roll bar allow owners to fine tune the vehicle’s handling characteristics. The 3-Eleven utilises a bespoke chassis based on the proven Lotus design of extruded and bonded aluminium sections. The roll-cage on both cars incorporates twin side bars for side impact protection, whilst the FIA compliant cage, optional on the Race car, only has additional bars to meet international requirements for motorsport. A competition specification fire extinguisher, battery isolator and motorsport towing eye are fitted as standard to the Race car and are offered as an option on the Road version. Ultra lightweight forged Aluminium wheels are fitted together with Michelin Pilot Super Sport tyres on the Road version, with the track focused Michelin Cup 2 tyres optional on the Road car but standard on the Race car. 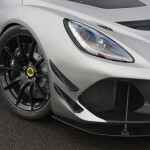 At the front 225/40 ZR18 tyres are fitted, and to help transfer the 3-Eleven’s considerable power and torque to the road, the rear tyres have been specified as 275/35 ZR19. In order to deliver the stopping power required for such a quick car, AP Racing four-piston calipers are complemented by two-piece grooved and vented brake discs (332 mm front and rear). Upgraded brake pads are fitted to the Race version. 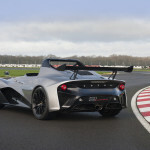 The Road car has a Lotus HANS compatible composite driver’s sport seat and 4-point harness as standard with an opportunity to upgrade to the lightweight FIA Carbon driver seat as fitted to the Race car. A removable steering wheel fitted to the Race version is an option on the Road car. Passenger seats with a 4-point harness can be fitted to both cars with two versions available: either the Sport seat which weighs 7 kg, or the lightweight carbon seat which weighs just 5.3 kg. The exterior of the 3-Eleven will have the standard base paint with Metallic paint and a Black Pack as options where key elements of the bodywork finished in matt black. 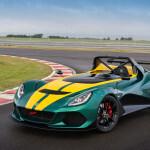 There are four bespoke colour schemes for the 3-Eleven; Metallic Green with Metallic Yellow stripes, Metallic Black with Metallic Gold stripes, Metallic Red with Metallic Gold stripes and Matt Black with Metallic Black stripes. 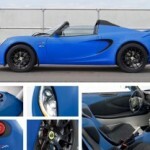 5th September 2014 Lotus Cars – The Lotus Elise S Cup, a road-going variant of the Elise S Cup R completes testing.